I get a lot of questions regarding what cage sizes are "adequate" for specific birds. The simple answer to this question has always been "Get the largest one you can afford." 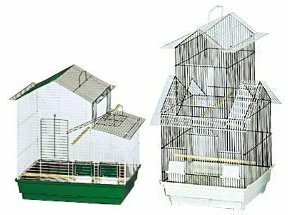 However, picking out the right cage to meet your birds’ needs can be more complicated than that, especially if you are introducing more than one bird or mixing species. There are several things you should take into consideration when choosing a cage. Birds fly side to side, not up and down. 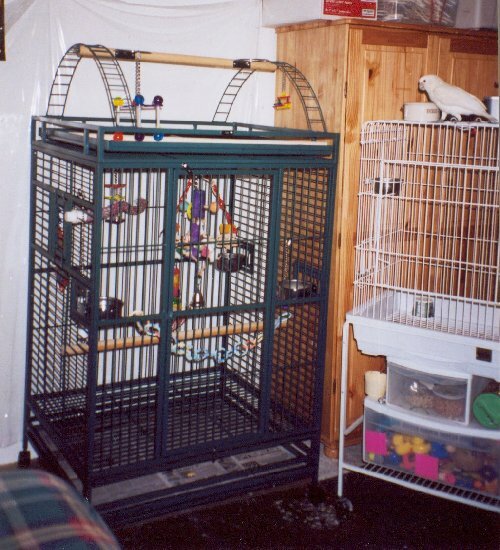 When I first started out breeding budgies I had a cage that was about 18" wide and long and about 4' high. It might as well have been 24" high because that’s the extent of it that my budgies used. Birds need space, but not height. Width is much more important. Had the cage been 18" wide and tall and 4' long my budgies would have used the entire thing. Stick to rectangular cages that are longer/wider than they are tall. Another funny thing about most parrots is that the smaller they are, the more space they need proportionally. Budgies require a huge amount of space when compared to a macaw (not quite to scale, but see below). This is due to their activity level. I cringe every time I see budgies kept in those tiny, blue, house-shaped cages that aren't even one foot in ANY dimension. This is like a human being forced to live in their shower stall or closet! One budgie requires 2-3 times as much space as a cockatiel. Why? Because budgies are more active! This is why smaller birds need more space- generally they are much more active than the larger birds. You can see the difference just by picking them up: budgies and most parakeets "jump" onto your finger (or your shoulder, or your head...); parrots usually "step up," rather than hop to you. Know your species: kakarikis, lovebirds and budgies are all extremely active. Nonpsittacine species like finches, toucans, mousebirds and other "softbills" are all very active. These birds require a huge amount of space no matter what their size- toucans require an aviary, macaws don't. This is not to say that all larger parrots are inactive and don't require much space. It is important to keep in mind the activity level of the individual bird as well. When my mitred conure Fry died, I bought a goffin cockatoo, Loki. Fry's cage was brand new, and huge step up from the original cage he came in. Fry was a fairly inactive bird, so it suited him just fine. Loki, who is relatively the same size as Fry was, found this cage abysmally small. Loki is an extremely active bird, and also easily bored, which means that many toys are required to keep his interest. Fry's cage was barely large enough for three of Loki's toys, let alone Loki himself. I began searching for a new cage, and ended up getting macaw/large cockatoo cage. The new cage currently contains 12 toys (two more on the playstand above), and there is still room for him to hop about. If you work away from home and your bird is locked up all day, then the cage needs to be very large. Like Loki's cage, it should have plenty of room for toys, and also plenty of room for the bird to hop about. Fry's cage [barely] had room for either one or the other. It's easy to overestimate the size of an unfurnished cage. If you're at a store, try placing a few toys inside to get a better feel for how much room you actually have to work with. If the bird won't be able to move around much with three toys hanging inside, then the cage is too small. For a bird that is home all day, the cage should be able to fit at least 2-3 perches (one can be a swing), 4-6 toys, food dishes and the bird itself (with room to jump from perch to perch). If the bird is out of its cage for a good portion of the day, then the cage can be smaller. 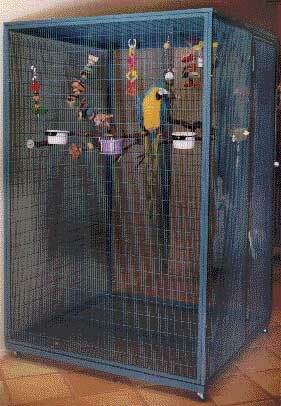 A birdie-safe "play area" will give your bird a change of scenery and allow it to interact more with you. 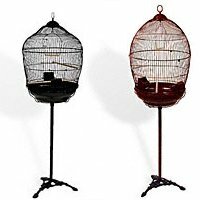 If a bird is out all day (for those lucky people who work at home) the cage can be much smaller because your bird will only be using it at night. Playstands should make up for the lack of cage size and contain plenty of toys, perches and other goodies to keep your bird occupied. No round cages! No cute house-shaped cages! Cages should be designed for birds, not humans. If you like the shape so much YOU go live in it. Odd angles trap toes, create unused space and make cleaning and accessing the cage a nightmare. Stick to squares and rectangles. These cages have their own distinct pros and cons. They are designed for optimal visibility and reduced mess. However, they contain no horizontal bars (although some now add a wire "climbing wall"), have reduced ventilation and climate control, and are extremely expensive. 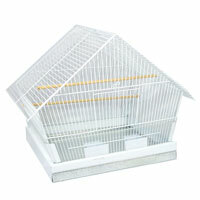 Below are examples of actual cages offered for sale. My negative comments are in red, my good comments are in blue. 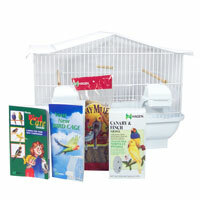 Your birds deserve the best- don't give them any less! This cage is too small to fit any species. Crippled birds deserve larger. "This deluxe starter kit begins with a stylish, quality cage..."
Overall poor design and shape. What does "stylish" have to do with birds? Beware of "starter kits"- they are overpriced and may contain junk you don't need (and not enough of what you do need). Looks like they would be terrible to access. Comes in whatever size you need, heavier wire if requested. Easy-access door, multiple doors if needed. Flaws: Designed mainly for breeding or outdoor use- may scratch some surfaces. Adequate size for tiels and conures. Metal seed catcher to reduce mess. On wheels to ease movement. Large, easy-access door and heavy-duty feeding crocks. Flaws: Taller than it is wide. 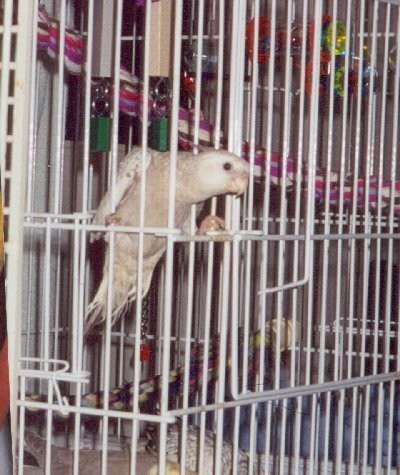 Thick, vertical bars make climbing difficult on front of cage. Pretty heavy-duty design for smaller species. Easy to access and clean. Good size for small or medium parrots. Flaws: Taller than it is wide. HUGE. 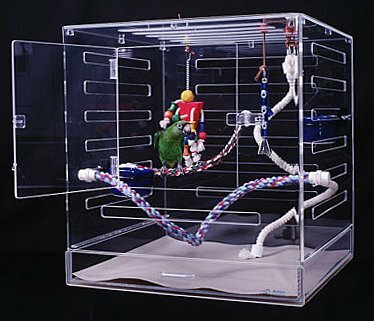 Most "large" parrot cages are only adequate in size- assuming you take your bird out a lot. These are very spacious. Flaws: Doubtful that larger parrots will use the space near the ground. Really expensive. Unfortunately all "nice" large parrot cages are expensive. 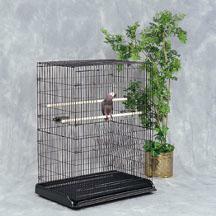 If you don't care about appearance and want more affordable large cages, look for breeder styles. No bars at all. However, note that the ventilation slots are cut for optimal climbing. This cage was designed with birds in mind. Product images stolen from various websites selling them. Everything else is © 2001 by Karen Trinkaus unless otherwise noted and may not be reprinted or used in any way without the author's permission.